Because I knew very little about FP when I first started working with Scala, I originally thought this was just some sort of syntactic nicety. But then I learned that one cool thing this does is that it enables you to write your own control structures. For instance, you can write your own while loop, and I show how to do that in this lesson. I demonstrate each of these features in this lesson, and show how multiple parameter groups are used to create partially-applied functions in the next lesson. That’s all there is to the basic technique. The rest of this lesson shows the advantages that come from using this approach. You must supply the input parameters in three separate input lists. def doFoo(firstName: String, lastName: String)(age: Int) = ??? Note: I use a var field here because I haven’t covered recursion yet. A thing that your eyes will soon learn to see when looking at code like this is that whilst must be defined to have two parameter groups. 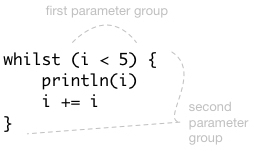 The first parameter group is i < 5, which is the expression between the two parentheses. Note that this expression yields a Boolean value. Therefore, by looking at this code you know whilst must be defined so that it’s first parameter group is expecting a Boolean parameter of some sort. The second parameter group is the block of code enclosed in curly braces immediately after that. These two groups are highlighted in Figure [fig:twoParamGroups]. You’ll see this pattern a lot in Scala/FP code, so it helps to get used to it. To create the whilst control structure, define it as a function that takes two parameter groups. As mentioned, the first parameter group must evaluate to a Boolean value, and the second group takes a block of code that evaluates to Unit; the user wants to run this block of code in a loop as long as the first parameter group evaluates to true. def whilst(testCondition: => Boolean)(codeBlock: => Unit) = ??? The two parameters groups are highlighted in Figure [fig:twoParamGroupsInWhilst]. If this happens, the whilst function would receive true for its first parameter, and the loop will run forever. This would be bad. But when testCondition is defined as a by-name parameter, the i < 5 test condition code block is passed into whilst without being evaluated, which is what we desire. In FP, the proper way to implement whilst’s body is with recursion, but because I haven’t covered that yet, I’m going to cheat here and implement whilst with an inner while loop. Admittedly that’s some serious cheating, but for the purposes of this lesson I’m not really interested in the body of whilst; I’m interested in its signature, along with what this general approach lets you accomplish. How many input parameter groups does ifBothTrue have? What is the type of the first group? What is the type of the second group? What is the type of the third group? def ifBothTrue(test1: => Boolean)(test2: => Boolean)(codeBlock: => Unit): Unit = ??? One of my favorite uses of this technique is described in the book, Beginning Scala. In that book, David Pollak creates a using control structure that automatically calls the close method on an object you give it. Because it automatically calls close on the object you supply, a good example is using it with a database connection. A nice benefit of multiple input parameter groups comes when you use them with implicit parameters. This can help to simplify code when a resource is needed, but passing that resource explicitly to a function makes the code harder to read. Given that background, let’s see what that implicit keyword on the second parameter does for us. Because b is defined as an implicit value in the last parameter group, if there is an implicit Boolean value in scope when printIntIfTrue is invoked, printIntIfTrue can use that Boolean without you having to explicitly provide it. printIntIfTrue works with only one parameter! The Scala compiler knows that printIntIfTrue is defined to have two parameter groups. It also knows that the second parameter group declares an implicit Boolean parameter. When printIntIfTrue(33) is called, only one parameter group is supplied. At this point Scala knows that one of two things must now be true. Either (a) there better be an implicit Boolean value in the current scope, in which case Scala will use it as the second parameter, or (b) Scala will throw a compiler error. Because boo is an implicit Boolean value and it’s in the current scope, the Scala compiler reaches out and automatically uses it as the input parameter for the second parameter group. That is, boo is used just as though it had been passed in explicitly. An area where this technique works really well is when you need to refer to a shared resource several times, and you want to keep your code clean. For instance, if you need to reference a database connection several times in your code, using an implicit connection can clean up your code. It tends to be obvious that an implicit connection is hanging around, and of course database access code isn’t going to work without a connection. That’s not too bad with just one Future, but more complicated code is definitely cleaner without it repeatedly referencing the actorSystem. If you’re new to Akka Actors, my article, A simple working Akka Futures example, explains everything I just wrote about actors, futures, execution contexts, and actor systems. I’ll show some of what this means in the following “implicit parameter FAQs”. <console>:1: error: &apos;=&apos; expected but &apos;(&apos; found. In theory, as the Specification states, “a most specific one will be chosen using the rules of static overloading resolution.” In practice, if you find that you’re getting anywhere near this situation, I wouldn’t use implicit parameters. When you get to that last expression, can you guess what will happen? This is a simple example of how using implicit parameters can create a problem. If you want to see a more complicated example of how implicit parameters can create a problem, read this section. Otherwise, feel free to skip to the next section. override def toString = "Person"
override def toString = "Employee"
override def toString = "Employer"
As a summary, I think this technique works great when there’s only one implicit value in scope that can possibly match the implicit parameter. If you try to use this with multiple implicit parameters in scope, you really need to understand the rules of application. (And I further suggest that once you get away from your code for a while, you’ll eventually forget those rules, and the code will be hard to maintain. This is nobody’s goal). Figure [fig:multParamGroupsDefValues] makes this more clear. I haven’t had a need for these techniques yet, but in case you ever need them, there you go. I showed how to write functions that have multiple input parameter groups. I showed how to call functions that have multiple input parameter groups. I showed to write your own control structures, such as whilst and ifBothTrue. The keys to this are (a) using multiple parameter groups and (b) accepting a block of code as a by-name parameter in the last parameter group. I showed how to use implicit parameters, and possible pitfalls of using them. I showed how to use default values with multiple parameter groups. The next lesson expands on this lesson by showing what “Currying” is, and by showing how multiple parameter groups work with partially-applied functions.